Diet sodas and other treats sweetened with artificial sweeteners are often viewed as guilt-free pleasures. Because such foods are usually lower in calories than those containing natural sugars, many have considered them a good option for people who are trying to lose weight or keep their blood glucose levels in check. 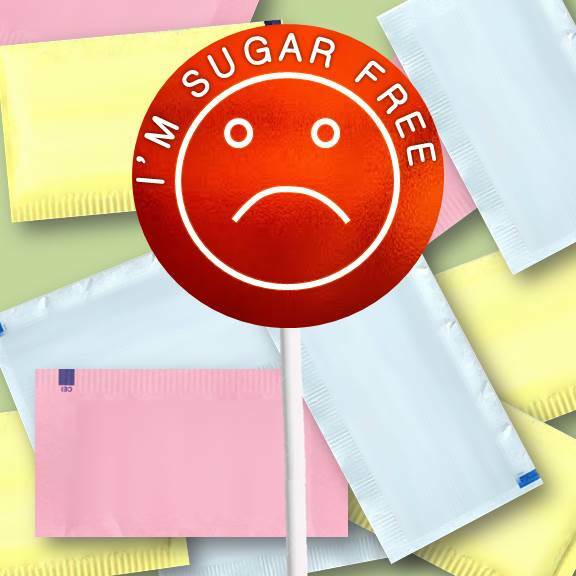 But some surprising new research suggests that artificial sweeteners might actually do the opposite, by changing the microbes living in our intestines . To explore the impact of various kinds of sweeteners on the zillions of microbes living in the human intestine (referred to as the gut microbiome), an Israeli research team first turned to mice. One group of mice was given water that contained one of two natural sugars: glucose or sucrose; the other group received water that contained one of three artificial sweeteners: saccharin (the main ingredient in Sweet’N Low®), sucralose (Splenda®), or aspartame (Equal®, Nutrasweet®). Both groups ate a diet of normal mouse chow. 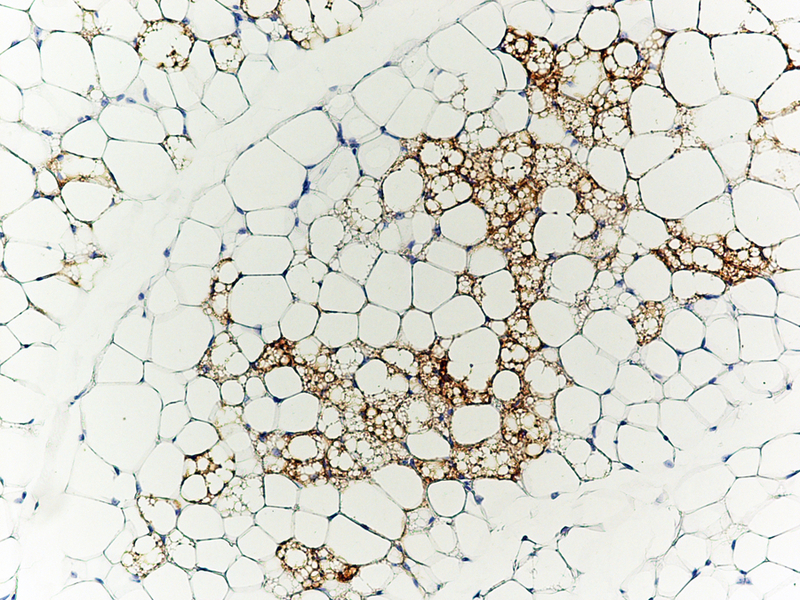 Caption: Brown fat cells (stained brown with antibodies against the brown fat-specific protein Ucp1) nestled in amongst white fat cells. Fat has been villainized; but all fat was not created equal. Our two main types of fat—brown and white—play different roles. Now, two teams of NIH-funded researchers have enriched our understanding of adipose tissue. The first team discovered the genetic switch that triggers the development of brown fat , and the second figured out how the body can recruit white fat and transform it into brown . Why would we want to change white fat into brown? White fat stores energy as large fat droplets, while brown fat has much smaller droplets and is specialized to burn them, yielding heat. Brown fat cells are packed with energy generating powerhouses called mitochondria that contain iron—which gives them their brown color. Infants are born with rich stores of brown fat (about 5% of total body mass) on the upper spine and shoulders to keep them warm. It used to be thought that brown fat disappeared by adulthood—but it turns out we harbor small reserves in our shoulders and neck. Drinking the occasional sugar-sweetened beverage, be it soda, an energy drink, sweetened water, or fruit punch, isn’t going to make you fat. But it’s now clear that many children and adults are at risk for gaining weight if they consume too much of these products. I want to share new research from three recent papers in the New England Journal of Medicine (NEJM) because, together, they provide some of the most compelling evidence of the role of sugary drinks in childhood obesity, which affects nearly one-fifth of young people between the ages of 6 and 19. In the first study , researchers randomly assigned 641 normal-weight school children between the ages of 4 and 12 to one of two groups. The first group received an 8 oz sugary drink each day; the second received the artificially sweetened version. 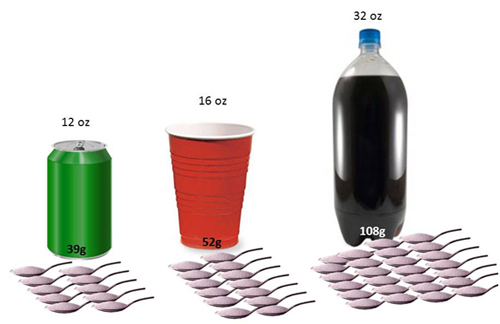 After 18 months, it was clear that the kids consuming the sugary drink had gained about 2.25 pounds more weight, compared with the kids drinking the zero calorie drinks. They also packed on more fat.